Back in the day [1962-6] at college in west Texas, I drank Pearl Bock Beer every spring. .. Pearl Brewing Co., San Antonio, touted both its artesian water from 'The Country of 1100 Springs' and its authentic 1886 recipe brought by its founder to America. .. I drank Pearl Bock Beer more because it was different/unique than anything about the particular taste to a then callow youth. Researching for a Boulder History Museum exhibition on the history of the beer in Boulder, I found references in historic newspapers to the spring release of buck beer circa 1869. I want to be misreading 'buck' for 'bock'; but, the digital images did not lie. Dave Thomas reports on Buck Beer ['buck', not 'bock'] from Tivoli Brewery, 1866-69, in his fascinating book 'Of Mines & Beer! 150 Years of Brewing History in Gilpin County, Colorado, and Beyond'. .. Buck Beer may have been a colloquialism of Colorado Territorial German immigrant braumeisters; don't know. Someday, I will put my best man on the topic. Get on that buck beer, Jack! Oh you know I have to leave on comment on this. I look forward to Bock season every year, and this year I found it on tap in Rochester. Very tasty! Plus, it's $7.99 a 12-pack. That works out to $.71 a can—including deposit! 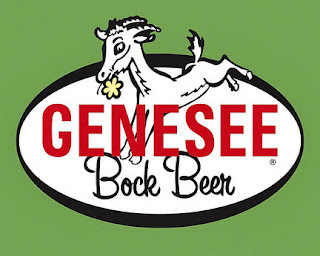 I am glad Genesee keeps up this tradition, I remember too when many breweries issued a bock at spring. They did in Canada as well, e.g. Labatt Superbock. The beers were good, not great perhaps by today's standards but they had more taste than the regular offerings (usually) and some neat labels. It is an era that has almost come to a close with the disappearance of most old-line regional breweries, but a few still keep it going clearly.